NORTH MANKATO – After a one-run loss to Kasson-Mantorville in the 2015 state championship and another defeat in last year’s title game to Zumbrota-Mazeppa, Maple Lake’s four seniors told themselves a third runner-up finish at the softball state tournament just wouldn’t do. 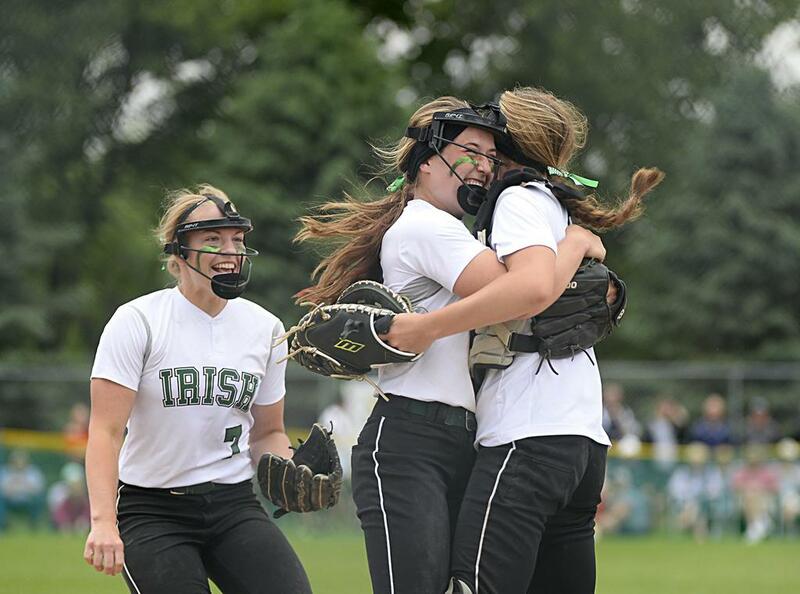 The Irish took that to heart Friday, scoring six runs in their first at-bat en route to an 11-1 rout of St. Peter in the Class 2A state title game to clinch the program’s first championship after four runner-up finishes. Maki scored twice along with fellow senior Linsey Rachel, while classmate Amber Klug went 3-for-4 and tallied two RBI. Sophomore Megan Carlson was 3-for-3 to drive three runs and scored two of her own for Maple Lake (28-1). Allie McCabe had the only hit for St. Peter (21-6), while Olivia McCabe scored on a wild pitch in front of a raucous crowd that traveled 13 miles to Caswell Park to watch the program play in its first title game. For the Irish seniors, snaring the state title caps a senior season in which they also claimed the Class 2A volleyball title. “It’s one of the best feelings ever. Such a great way to go out,” Maki said.